Comprehensive review of BPI Sports Best Protein. See what real experts and actual users have to say about this protein powder. 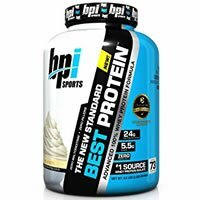 BPI Sports Best Protein gets 3/5 stars from us. It definitely has some great pluses to it but a few areas it falls short in our eyes. We really like that it has a solid 24 grams of protein and 5.5 grams of BCAAs per serving and can benefit both men and women. The protein source is 100% whey protein. It suggests women use 1 scoop (24 grams of protein) and men use 2 scoops (48 grams of protein). Obviously, this is just a suggestion but it allows you to easily hit your personal daily protein needs. Best Protein can be useful for a number of different areas. It’s good for building muscle (especially lean muscle), muscle repair, performance, and weight loss. It’s best used right after an intense workout because it stimulates muscle protein synthesis and helps replenish and repair tired muscles. This protein can be used as a meal replacement shake that can aid fat and weight loss. It’s low in calories, fat, sugar, while being high in protein. This product is also super affordable, didn’t cause side effects, and is easy to use. We really wish it had a satisfaction or money back guarantee, though. It doesn’t even really have a feasible return policy. This is a definite bummer. There’s also a slight bitter aftertaste, even though that’s fairly common with protein powders, especially those using Whey Hydrolysate. As a note, it contains milk, soy, and sucralose, for any of you that are sensitive or allergic. Overall, this protein powder is better than average and may offer you some great benefits in your fitness or weight loss journey. This protein powder is a breeze to use. Just take 1 scoop and mix it with 5-6 ounces of cold water or liquid (ideally immediately after a workout). You can mix it 3 different ways: shake, blend, or stir. I found the best and easiest way was to use a shaker cup. It quickly dissolves in about 10 seconds of shaking. You can use a spoon to stir it up in a pinch but the texture isn’t as smooth. Blending it gives it a nice thick shake texture. I got this protein in the Salted Caramel flavor. It’s also a limited edition flavor. I was pleasantly surprised because when I mix it with just water, it actually tastes really good! There’s a robust caramel flavor with slight hints of vanilla. It’s definitely on the sweeter side, which is a plus for some people and a negative for others. However, the taste isn’t overwhelming, which I like. It has a slight bitter aftertaste that is common when Whey Hydrolysate is used in the formula. I ended up mixing it with almond milk and it turned out pretty delicious every time. It also comes in other flavors like Chocolate Brownie, Cookies & Cream, Smores, Vanilla Swirl, and Strawberries & Cream. Let’s go over the macros analysis for Best Protein. In this formula, every serving has 24 grams of protein, 1.5 grams of fat, and 3 grams of carbs. And every serving or scoop has 120 calories. This is a solid macros profile and can aid in muscle building (especially lean muscle), strength, recovery, and weight loss. BPI Sports Best Protein contains 100% whey protein. It uses a protein blend of 3 types of whey including: Whey Protein Isolate, Whey Protein Concentrate, and Whey Hydrolysate. I really like that whey is used because it’s very easy for the body to absorb and digest. The primary source of protein is micro-filtered Whey Protein Isolates that are the purest form of Whey and contain about 92% protein, whereas Whey Protein Concentrate is about 80% protein. Whey Hydrolysates are partially broken down proteins, which make them absorb more rapidly. However, all 3 forms of whey are very fast digesting. Best Protein has 5.5 grams of naturally occurring Branched Chain Amino Acids or BCAAs in each scoop. BCAAs are important because they aid in muscle growth, delay fatigue, and encourage muscle protein synthesis. This protein powder is low in fat, carbs, and sugar, making it great for lean muscle growth. It also uses Sucralose, an artificial sweetener. Overall, it’s a quality protein powder that has zero protein spiking and no unwanted fillers like maltodextrin. While taking Best Protein, I didn’t experience any negative side effects. I didn’t feel sluggish or bloated. I did feel fuller and had a bit more energy during and after my workouts. Keep in mind that if you have allergies that it does have milk and soy in the formula. This protein powder can potentially be used in a number of beneficial ways. It’s good for building muscle and strength because it provides protein and fuel for lean muscle growth. It’s best taken right after an intense workout because it aids muscle recovery and rebuilding. Best Protein can also be used for weight loss because the protein content supports fat loss and can help you feel full for longer. BPI Sports suggests that this protein powder can even be used as a meal replacement shake because it’s low in calories, fat, and sugar and high in protein. It costs $35.99 for a 2.0 lb. container of BPI Sports Best Protein. This container will get you 28 servings of protein. With that being said, it works out to 5.35 cents for every gram of protein. That’s actually very affordable and less expensive than the majority of protein powders out there. 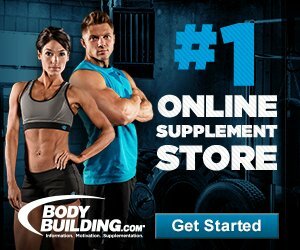 They also offer discount codes from time to time, for instance as I was clicking around their website, I was offered a 20% off coupon code for one product. Keep in mind that shipping is about $4.95 for standard 3-6 day shipping, which isn’t bad either. Overall, I think it’s a good quality product and value for the price. Sadly, BPI Sports doesn’t offer any type of satisfaction or money back guarantee. I wish they at least had something to offer their customers. To make matters worse, they don’t even really have a viable return policy. If you want to return an item, it must be returned within 30 days and has to be unopened, unused, and in its original packaging. It also may be subject to a 15% restocking fee. This really isn’t a return policy to me if you can’t even try the product in the first place. To buy BPI Sports Best Protein, click here.